Last time Seattle Opera saw bass Peter Rose, he was front and center as Falstaff in 2010. This time around, we have the privilege of hearing him in the supporting role of Timur in Turandot. In today's Q&A, we chat with Rose about this character, look back to some of his all-time favorite roles, and learn what's up next on his busy schedule. For more on Turandot, which opens Saturday, August 4, and runs for 8 performances through August 18, visit seattleopera.org/turandot. 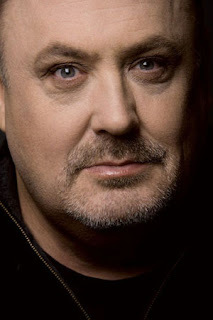 The last couple times you’ve appeared in Seattle, we’ve heard you sing big roles (Baron Ochs in Der Rosenkavalier and Falstaff). Is it nice to get a change of pace and sing a supporting role? As you say, I often do very big roles, so it’s nice to do a role where you don’t feel that you have to carry the show, or you’re one of the most important cogs. It’s actually quite a nice relief to now and again do a role like Timur, or like Gremin, with just an aria at the end of Onegin. Nonetheless they’re important roles. How many times have you sung Timur in the past? Not many times. I’ve done it twice, in Berlin and in Covent Garden. 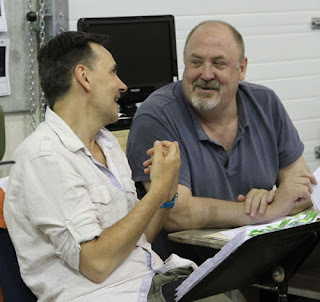 Stage Director and Choreographer Renaud Doucet (left) works with Peter Rose (right) during rehearsals for Turandot. Stage Director Renaud Doucet mentioned how pleased he was to have you as Timur in this production, because this role is sometimes downplayed. Well, yes, sometimes secondary roles like this are under-cast. But you get a better show, overall, if you cast every role strongly. I think that’s probably what he meant. The small amount of music I’ve got is very beautiful music, so it’s quite an opportunity even if I’m not singing all evening. There are some nice, beautiful, lyrical lines. Let’s think about what happens in Turandot’s world after the opera finishes. What do you think happens to Timur? Well, he’s very old—so I imagine he doesn’t go off into the sunset. He doesn’t last much longer. He’s obviously been either tortured or beaten to try and get the name of Calaf, and Liù, who has helped him, is dead. So I think he’s probably quite a broken man, I would imagine. I don’t get the impression he’s living happily ever after, even though his son might. Peter Rose (Timur) and Antonello Palombi (Calaf) rehearse the father/son reunion in Turandot. What’s Timur’s relationship with his son? One would think his son, now in power, would try to help his father. I think his son is independent. But I think he loves his father and there’s a genuine and good father-son relationship there. When Timur meets him in the beginning of the opera, he really thought Calaf was dead. He’s surprised and grateful that he’s not. What about Timur’s relationship with Liù? She’s his slave, but there seems to be a genuine affection there. Well, look how the mighty have fallen. He was the emperor and he’s been reduced to being a beggar. And this slave girl says “I’ll be your guide. I’ll be your eyes. I’ll help you.” And of course that’s a very generous thing and I think on a human level he appreciates that. 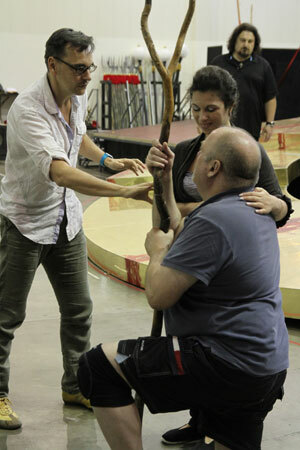 Renaud Doucet, Lina Tetriani (Liù), and Peter Rose in staging rehearsals for Turandot. After you wrap up this role in Seattle, where do you head to next? After this, I go to Paris and do La Roche, which is a big role, in Capriccio by Strauss. So that’ll be very nice, and it’ll only be my second time. I did it for the first time last year at the Met. And then after that I have some concerts of Tristan und Isolde, and then I’m doing Ochs in Der Rosenkavalier with Simon Rattle in Berlin. That takes me up until Christmas, and then the whole thing starts again next year. Looking back on your career, can you identify a favorite role you’ve sung? I think Ochs is one of my favorite roles, and I was lucky enough to do that here in 2006. It’s just a fantastic role. It’s great music and it’s a great opportunity for the stage because he’s such a complex character. Within the space of a phrase or a bar, he can change to being annoying or loveable or irritating. You can be wincing at how gauche he is and in the next moment be thinking, “Oh, how sweet,” and then feel sorry for him. There’s a lot of opportunity for the dramatic. 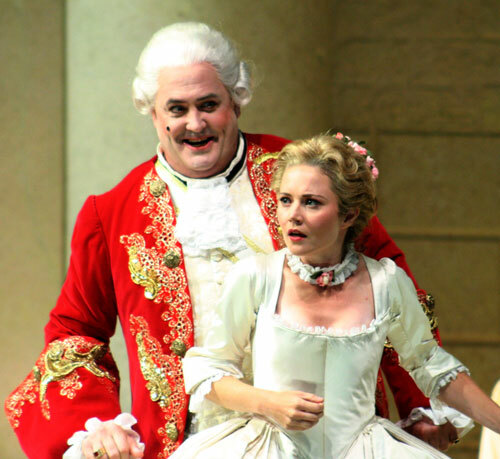 Peter Rose as Baron Ochs, with Julianne Gearhart as Sophie von Faninal, in Seattle Opera's 2006 production of Der Rosenkavalier. Richard Strauss I have an affinity with because I do so many Rosenkavaliers and am beginning to do more Cappricios. Wagner, of course. I love Verdi, I adore Mozart. And while I think Puccini writes the most exquisite music, there are no real great bass roles in any of his operas, which is a shame because I absolutely love Puccini. Somebody will probably correct me, but I can’t think of any. Sopranos, tenors, and baritones get the lion’s share of Puccini’s music. But you have sung a few of those smaller Puccini bass roles. Yes, but I haven’t done that much. Timur is one, I’ve done Colline in La bohème, Simone in Gianni Schicchi, and the Bonze in Madama Butterfly when I was much younger. Verdi was the Italian who wrote great roles for bass. 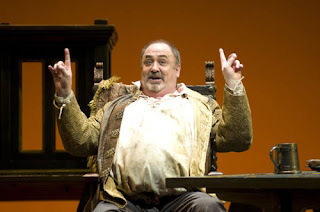 Peter Rose as Falstaff at Seattle Opera in 2010. You get the chance to listen to a lot of great music in Turandot. Do you have a favorite moment in this opera? Well, of course, the most famous moment is “Nessun dorma,” which everybody knows unless they’ve been living on another planet. And of course it’s beautiful. But there are other exquisite moments: Liu’s aria in Act 1, then the music that comes out from Calaf right after that, and then the big ensemble. There are fantastic moments, so I wouldn’t want to say there’s one I particularly like because Turandot is full of great ones.